We planned this trip long before last Monday. We planned it before bombs went off in Boston, before terrorists were caught with plans to blow up a train. Are we nervous about taking a train to Boston tomorrow? Nope. But we are thoughtful about it. I really think Boston is quite safe at the moment, and that we need to not cancel our trip. People need to keep going to Boston, not shun it. So we will. Luckily, we are not staying near Boylston Street, so I think we will have no trouble getting to our hotel, or around from there. So, tomorrow morning by 5 am we will be headed out the driveway to Portland to catch the morning train. They say it will stop raining here mid-morning, so I hope that means it will stop raining in Boston sooner than that. Looking forward to some good food, good sights, maybe a bit of shopping? And of course, knitting on the train. I finished up the big, bulky cowl last night (pictures when I find some good buttons), and wound the yarn for a pair of socks – a more portable, lighter weight project. Good for a long car/train ride. We are both really looking forward to the get-away. Sister-in-law L is coming along too, so we will all have a fun time together. We had an absolutely lovely time in Boston playing tourist. Left Thursday at 5 am to catch the 8 o’clock train from Portland. Caught it without a hitch. The train was full, but we had seats together, so that didn’t matter. We landed in North Station, and immediately boarded the Old Town Trolley. We rode the almost the whole loop, winding up directly in front of our hotel – the Marriott at Long Wharf. Our room was ready, so we dropped our things and headed over to Quincy Market for lunch. So many choices! After lunch, we went over to the aquarium, which was nice, but is under construction, so most of the penguins were gone. We did go to the IMAX theater and saw a short film on polar bears narrated by Meryl Streep, which was fun. After that, we headed back to the room for a rest, and then had dinner at Legal Seafood, again, right out the door of the hotel. It was very delicious, but so noisy, and we were so tired that we just ate our dinner and left. Yesterday morning we got up early and had breakfast in the hotel, then went over to Quincy Market again for a few cookies for the train ride, and hopped on our trolley again. this time, we rode around through the North End, and then got off at the Public Garden. We wandered through that and then through Beacon Hill, which I had never explored before. Took lots of photos of the beautiful homes and their lovely spring window boxes, before heading down Beacon Street to hop back on the trolley to go over to the Pru shops for lunch at the Cheesecake Factory there. A had spotted it when we drove by, and wanted to eat there. So we did, then rode the trolley back to North Station and waited for our train home. We were glad we had stumbled upon the trolley. Even though it was an extremely touristy thing to do, it was a good way to see the highlights of the city, and as it seemed to go near everything we wanted to do, and was handy to our hotel it was a nice easy way to get around. I guess if we went to the city often, we would do our transportation differently, but it worked for us. So did splurging on a nice hotel – still haven’t figured out what was going on in the city that made it so hard to find a hotel room with two beds, but glad it led us to our nice hotel. It was fun to wander around Beacon Hill and see all many of the places LM Alcott lived, given that I was reading Marmee and Louisa on this trip. The history that lives on the streets of Boston is just amazing, it gives me shivers. A doesn’t think about such things very often, and wants to hurry through, but she didn’t mind yesterday, especially as L was also enjoying wandering around looking at all the buildings, and fancy doorways. The weather was warm and beautiful – breezy enough to keep us cool, but sunny and dry. We got home around 10 last night, exhausted, but happy. We realized we did little but walk, ride the trolley and eat, but we had a fun time. Could not have asked for a better trip! Yesterday we did everything on the list, and then some! Got the license, got A’s ring, left my great great grandmother’s to be resized forme (A is afraid to be responsible for an heirloom, so I will wear it. I think heirlooms are not good if you can’t use them and enjoy them.) SO I think we are ready for 5/19 activities. Today, A’s sister L came over to help with the never rending insulation project – today was in the basement. I ran errands, and when I got back, learned I missed all the excitement – they found a mouse nest complete with Mom and tiny babies. Probably just born, as they were tiny and hairless. Managed to round-up the babies, but mom remains in down there, we think. Kittens were FASCINATED with this new toy, but we don’t think they got her. Found a few places where little critters could get in, and plugged them up with wood and foam insulation. I bet we find more of all of this as we go forward with this. So, since we have no idea what was really in all the insulation pulled down, I spent a good chunk of time driving bags of it over to the transfer station. We went out to lunch to Crosby’s, our favorite take out place, and the planned wedding lunch place. Food was yummy, just as we remembered it. A little chilly, but it will be warmer next month. While A and L continued to foam and do other projects down stairs, I worked on cleaning out the loft so that we can paint it. I have been putting that chore off for weeks now. I think I just have to vacuum and roll up the rug and I will be able to paint half the room. Then, move everything to the other side. Sigh. I wish it was just painting, but there is all the cleaning and clearing that happens first. On the needlework front, I finished the last hat with the red yarn – total hats – seven. A variety of size sand styles, as you can see. Hard to see details of them when they are all the same color and I am not a great photographer, but here you go. I could start my own red hat club! I also am making good progress on the baby blanket – it’s the first thing I have crocheted in a long time, I really am enjoying the fast progress. 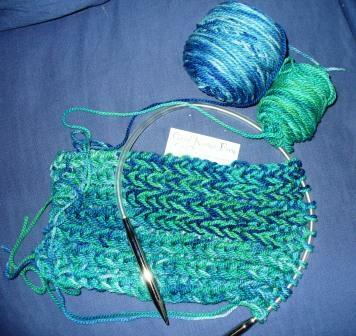 Lastly – when I finished that last red hat, I gave myself permission to stop doing hats for one project – the blue-green cowl. I am knitting it on HUGE needles I got from Nancy’s stash, so big I don’t have a way to tell what U.S. size they are. They are 80 mm 12 cm Addi turbos. Yikes, between using them and the yarn doubled, this will fly. It will be my “mobile” project this week. I got the basics of the pattern from the folks at Good Karma Farm, where I got the yarn the day Mom and I went shopping in Belfast. It is pretty cool, something I have never tried before – first row is k1 p1 (here I go again!) but after that pattern is set, then on all the k stitches, you k the stitch in the row below. It makes it very thick and chunky. I put the business card in there for scale – this is super big and chunky, using fairly bulky worsted weight yarn doubled. I plan to have this cowl button, so I can wear it as a scarf if I prefer – I made the button holes by binding of one stitch each, they are still huge, of course, so I will have an interesting time finding just the right buttons. Tomorrow will be more of the same, I think. Then back to work for me, while A has the week off. We will have to get a few things done before we head to Boston on Thursday, but it should be a pretty straight forward week until then! I’ll have to think about what knitting project I bring along – a couple of hours on the train in each direction means I will be able to get a lot done, BUT I will have to carry it along the whole time. Nothing too big then. Well, this has been one heck of a week, work-wise, current event-wise, life-wise. Some good, some not. Boston. Washington. Texas. Iran. Holy cow, it is overwhelming. What are we doing to ourselves? On the home front, I was interviewed by the local paper for a story on identity theft and tax fraud. They wound up using the info I provided, but no quote. 😦 But if the info helps people know what to do, that is all good. I don;t need the glory. Can’t remember if I told you about more changes at work (constant!) but they are starting to settle in, and actually, they feel pretty good. If they go as planned. I’ll be giving up my current job for a different one within the agency, working for all divisions writing grants. Very different, yet not. I’ll be glad to shed some of my duties, but will really miss working with the clients. that change happens 5/6, and I think it will be a summer of transition, as i work with the woman taking over my role, while at the same time, settling into my new one. Whew! Lots of details to plan in that process. Today I went to Orono and Bangor for two meetings. While there, I managed to stop in at a LYS to order some wool for the crochet-a-long in June. I hope it arrives in time. If not, well heck, I will have to use some of my stash and do something different with this yarn. lol, such a problem to have. Then I went over to the big box store and showed ADMIRABLE RESTRAINT, picking up some adhesive for card making and a larger crochet hook for said CAL. It took me an hour, and many things went in and out of the cart. But I really didn’t want to blow my crafting $$ there, so I only got what I can’t get elsewhere, and then some spiffy magazines. Always love to see how to, color combinations, new ideas. Oh, one thing I did was mail the leg warmers off today – they rode around in the car all week waiting for me to be near a post office when it was open. Clerk said they might be delivered tomorrow, can’t wait to hear how they work. 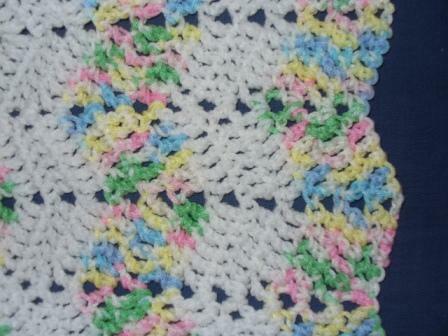 Time to go do some crocheting on the baby blanket for A’s coworker’s new baby, due in July. Blanket is half done, I love how fast crocheting goes! Here’s the thing – I have to give you 11 facts about me, answer Fiona’s questions, choose 11 blogs that I like that fit the category to nominate, and ask those bloggers to answer 11 questions for me, go let them know I nominated them (no tag backs!). So, here goes. 1.) I live in rural Maine. 2.) I like to do handwork of all types. 3.) I would rather pay more to buy from a locally-owned store than shop at a national or international conglomerate. 4.) I LOVE to swim – fresh and salt water and pool, they are all good. 5.) I love to sail. 6.) I am a huge (and this year happy) University of Connecticut women’s basketball fan. 7.) I love to garden but you can’t tell that from my yard. 9.) I am NEVER without my knitting. 10.) I love to play brain games on Nintendo DS. 11.) I’m getting LEGALLY married to my long time partner on May 19. And we can’t thank the voters of Maine enough for making it possible. 1.What is your favorite craft? That is really hard to say – it is a tie between card making and knitting. I don’t remember starting, really, but I do remember spending time with Gram B. as a little girl, and having her teach me various things – embroidery, sewing, arts and crafts projects. She always had something artistic going on, and Ma N. always was knitting something or painting. Even though my Mom didn’t have time to do that kind of thing when I was a kid, I spent enough time with those two grandmothers to get an early founding in all things crafty. 3.Do you want to make your crafting into a career? I WOULD love to get paid to do this, somehow. Still haven’t figured out how to make it happen, though. 4.What project are you most proud of? 5.What’s your favorite crafting blog? Not sure I have a favorite, although I am always interested in the teaching of the sweaty knitter, and the ladies at watch out world and not your average crochet keep me always thinking. And of course, http://www.shemakeshats.com inspires me every day. Most recently, it is LIncoln, although, as I wrote about, I thought it should have ended with him leaving for the theater. Before that, and probably again someday, it is anything clever with Cary Grant. 7.What country would you most like to visit? 9.Do you have any pets? I do – 2 cats, Allie Cat and Zumba. They were a year old on 3/2/13, and will have had them a year on 6/2/13. They are the light of our lives. 11.What’s your favorite crafting website? Don’t really look at a lot of these – I guess it would be ravelry, or the websites of some of my favorite yarn stores. I also like the Hero Arts website because they have their catalog as a pdf so I can drool over it. 2.) What in your life really excites you right now? 3.) If you weren’t afraid of anything, what would you do tomorrow? 5.) Who do you want to inspire? 6.) What were you doing right before you started answering these questions? 7.) Favorite flavor ice cream? 8.) Best book you ever read? 9.) What made it best? 10.) Favorite place on earth? 11.) Best gift you ever got? This is hard work. 11 is too many facts to think of, too many questions to think of, and not enough nominations for all the great blogs I follow! But I thank you, Fiona, for the nomination, and for liking my blog this much. I am interested to see what the response is from my nominees. Finito! Complete! OFF THE NEEDLES!!!!! Author salpal1Posted on April 13, 2013 Categories how it came out, What I loveTags knit, leg warmers, off the needles4 Comments on Finito! Complete! OFF THE NEEDLES!!!!! Finish the darned leg warmers! Post office – ooh, yarn winder delivered, AND first ever Webs order. Resist winding all yarn in house, because it is so fun to do. Notice the groceries, the dump and the spring cleaning are gone. I should have remembered that since this is the first Friday at home, I would be really slow to get going, with little or no energy, in spite of the really long list of things that are calling me. I think knitting will get the rest of my afternoon. Maybe I will clean the bathroom so that tomorrow is a more pleasant day. But maybe not, too. the new yarn winder distracted me. I have read blogs and reviews from people who just couldn’t stop talking about how great this tool is. I have been knitting for more than 40 years, winding balls by hand, and really thought they were all a bit overboard. But I won that basketball bracket bet, and so got my own winder, and now I know – they were all understating how great this thing is. My word, in MINUTES I can wind a whole skein of yarn! It is neat, tight, the pull out yarn is easy to find. WOW. I love it. I already had a swift, and thought that was all the help I would need to wind great skeins. Was happy with it for many years, but now I know, it was only half the solution. Author salpal1Posted on April 12, 2013 Categories how I plan to spend my day, what I am thinking about makingTags Friday, Halcyon Yarn, knit, to-do list, webs, WIP, yarn, yarn winder2 Comments on sweet Friday! This is a nice day – we totally chilled this morning, lounging in bed until lunch time, just reading (this is a family friendly blog, don’t forget!) and relaxing. A had to do a bit of work, so she is gone for a few hours. Had a long talk with Mom this morning, they just got back from a spring trip down to the carolinas, where is really is spring, I guess, though not as warm as it could be. Talked to her about doing our wedding service, and she said yes, so now we just have to pick a date and get the rings and license. 🙂 WOW. Amazing. 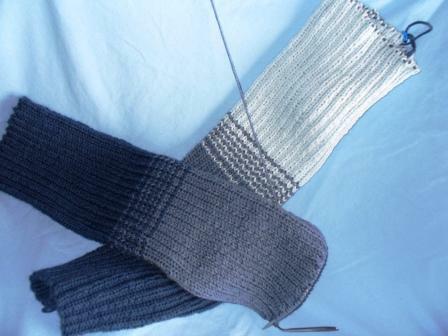 It is so hard to work on the leg warmers that go on forever, but I am doing it everyday. My goal is to have them done by the end of the last basketball game Tuesday night. I might make it – I have about a third of one to go. These photos don’t do justice to the length… And the completed one is not bound off, in case I have to reknit it to make it the same as the second one. I essentially just knit until the yarn was gone, if the skeins aren’t the same length, I will have to adjust one of these. So I hope the skein for the second one is NOT shorter than the first one. then I can just stop at the same point, bind them both off and drop them in the mail. She will get them before July! And I will get to start a new project. I sorted through some baby blanket patterns and decided I needed more yarn for the one I planned, so went to the hardware store to get some. That’s right – our hardware store carries yarn, and if they don’t have that special acrylic you are looking for, the chances are good that our local pharmacy will. Only in rural America. 🙂 Anyway, they did have some that will do, so I got 4 skeins of it – for 17 dollars! That is the good part about using acrylic.